Reading Notebook Wall of Fame in Abby Opar's classroom at Browns River Middle School in Jericho, Vermont. As a literacy coach and consultant, I get a lot of questions sent to me! I'm fortunate to work in a range of very diverse schools, across districts, and across states. I support teachers and administrators from the rural Northeast Kingdom of Vermont, to the suburbs of Boston. I've worked with schools in California, Washington, North Carolina, Ohio, New York, Florida, Kentucky... the list goes on. One of the hottest topics, regardless of location, is always reading notebooks. In this post I will attempt to answer some of those questions. Q: I would love any ideas or thoughts on reading notebooks specific to readers who are reading early chapterbooks. What do the teachers at your school expect in reading notebooks? So, I work in LOTS of schools this year, across four very different school districts. But the one thing I can say, about every school I work in currently is that reading notebooks are generally introduced once students are reading around level J/K, though this isn't a strict rule, with the idea being that once kids are reading longer books, a notebook can help them to track their thinking, and can be a great tool for sparking deeper conversations about books. Until then, I really wouldn't expect kids to do a lot of stopping and jotting - except maybe a quick post-it here and there to keep track of important pages, questions, or big ideas they want to talk about. In the notebooks, we would expect to see kids stopping and jotting, just little notes. These notes are meant to help them keep track of ideas, understand the story better, and especially prepare for having conversations. Students might sketch a picture, keep a running timeline, or create a chart that helps their understanding--but nothing that takes much time away from reading. Occasionally, teachers might prompt students to pick one idea to write longer about. Some teachers do this as a routine, say once a week. Others do this in response to the work they are doing in a unit, or with a small group. Q: What's the best way to set up a reading notebook? Self-reflection, self-assessment, and goal setting are skills that I've been working on a lot lately, so sometimes I like a separate section for that work. Sometimes I just include it in the existing sections. I also love to invite kids to decorate/personalize their notebook to reflect their reading life--just like the writing the notebook. Q: How do students use their reading notebooks? During read-aloud, I might prompt students to stop and jot in the read-aloud section. As kids get older they sometimes jot on their own during read-aloud--though I'm careful to observe closely and assess whether jotting is actually helping or interfering with understanding the story. I usually start here before teaching kids how to use notebooks during reading workshop. When kids are ready to learn how to use notebooks during reading workshop, I teach kids strategies they can choose from (choice being the operative word). Occasionally I might prompt everybody to try something, but mostly I like to say, "I want you to keep your notebook open and ready, in case you have a great idea to jot down, or a question for your book club" or I'll say, "It doesn't matter to me HOW you stop and jot, but you do need to keep track of your thinking somehow! You get to decide! If you're stuck, look at our anchor chart!" I always offer post-its as an option as well - it truly doesn't matter to me what they choose to do - but I do get concerned when a student is not jotting, or even sticking a post-it on a single thing. If anything, I want them to be in the habit of coming to their book club (or partnership) prepared with something to say, or a few pages to refer to. Post-its and notes are signals to me that the reader is engaged; jotting, sketching, and talking are the work of reading workshop. Q: What can you suggest or point me towards in regards to making the notebooks more effective and fun for the kids? I often find that it is very tempting to give kids little assignments to do in their notebooks - whether it's in class or at home -- but beware! Turning the notebook into a collection of teachers-selected assignments can kill it for kids. But they also need to know that they're expected to be engaged readers, and to be prepared for their book club conversations. As a literacy coach, I will often demonstrate minilessons where I literally say to kids "You can use your notebook however you want! You can draw! You can sketch! Use colors! Make a chart! Write a quote! Whatever you want... but you have to do something." I've never had a group of kids that wasn't at least a little bit excited by the idea of doing whatever they want. However, sometimes it's not that kids don't want to stop and jot--instead, they just aren't sure how. I sometimes show kids (or just the teachers) this quick sketchnoting video to get them excited about using their notebooks and then I put colored pencils at every table for kids to use. (There are 100s more like this one on youtube!) Sketchnoting isn't for everyone--but I have observed that it slows kids down, in a good way. The lettering, the sketches, borders, and other visual aspects can help make the content more memorable for many kids. Other times, I put my own reading notebook under the doc cam and show them the "coolest" pages (kids like the pages with a lot of drawing/charts/color the best) and invite them to use their notebook in any way they want. Occasionally I have to do some coaching, circulating around the room, to give reminders to the kiddos who are writing/sketching/drawing too much - but generally, it's a good problem to have. I would rather have overly enthusiastic sketchers and drawers, than having kids who begrudge the notebook - or worse - learn to hate reading because of it! * Thanks to my friend and colleague, Kathleen Sokolowski, for the best questions. * Thanks to my teacher friends Katie LeFrancois & Portia Senning for sharing their students with me and trying out the innovative notebook work you see in this post. I happen to live in a state that is largely rural and largely white. For some adults in our community, it feels easy to ignore what's going on beyond our "bubble" and to go on with life as usual. Lots of people I know aren't comfortable having conversations about race, and are worried they'll make a mistake, so they avoid it altogether. I worry that I'll make a mistake too. However, it's BECAUSE our community is largely white that I hope educators find the courage and the resources to face history, and teach empathy, kindness, critical literacy, and give all kids, white kids included, tools for living peacefully in a diverse world. Read-alouds, videos, news for kids, and other resources make it possible to bring diverse voices into all classrooms and can guide conversations about difficult topics in ways that are appropriate for all age ranges. Reading stories from many perspectives helps students develop empathy, makes unfamiliar ideas and cultures more familiar, and can dispel misconceptions by providing information and multiple perspectives. I've been following #WeNeedDiverseBooks and #educolor for years, and the recent of explosion of resources at #CharlottesvilleCurriculum has been remarkable. Many educators I work with, however, aren't on Twitter, or aren't sure how to sift through all the information to find what they need, so I've attempted to round up resources for the people I work with most often. Hopefully, you'll find something here for you and your students as well. My plan is to update this frequently, focusing on sources that I trust, and resources that feel like they will stand the test of time. If you know of a resource that could be added or spot a problem with a resource I've listed, don't hesitate to leave a comment. Today I had the pleasure of working with preschool educators from across my own school district about my favorite topic: joyful literacy. I shared some ideas for fostering a love of reading and writing for our youngest learners. We had a great conversation about what play means in a preschool classroom, and how to foster a love of reading and writing that is play-based and child-centered. These slides contain interactive links to some of my favorite resources for early childhood educators. You may have noticed word walls and “snap words” mentioned throughout the reading and writing Units of Study books (Heinemann, 2013, 2015). This refers to the 100 most frequent words in English (high frequency words). These words can be introduced a few at a time each week, and added to a large word wall in your classroom. In third and fourth grade, you might not need a word wall if your students have mastered 100-200 high frequency words. “Mastering” high frequency words means that students can read the word on sight and write the word automatically, without hesitation or “sounding it out.” These words serve an important role in learning to read -- and knowing them on sight allows students to save their energy for more challenging work. Just a handful of words per week (3-5) is typical. At the end of the week, you can informally assess you whole class’s recognition of words by asking them to write the words on a white board. If the majority of your class has mastered a word, you may move on to teach a new word the following week. If most still need to stop and think before writing the word, continue with that word before adding new ones. VISUAL: Invite kids to look closely at the word, written large on an index card. Talk about the shapes of the letters, draw a box to outline the shape of the word. AUDITORY: Spell and say the word repeatedly. Rhythm and/or singing helps commit the spelling and the word to memory. KINESTHETIC: Write the word large, small, in the air, on a white board, with different materials to build muscle memory for writing the word and remembering the word on sight. COMBINE ALL THREE: Many teachers invent “cheers” for each new high frequency word that help students remember the word on sight. Which of these describe your classroom? A range of readers whose reading stages and interests span everything and anything. If you look at a list of independent reading levels for your class, you would see a good portion of the alphabet! Some of your students have expansive vocabularies, while others do not. Some of your kids have the habits and stamina to read and write for long stretches of time, while others have trouble keeping themselves focused for more than a few minutes. There's a good chance that at least one of these describes your classroom, whether you teach more than one grade, or you teach a single-grade classroom. No matter the configuration, there will always be a wide range of personalities, levels of experiences, student needs, and learning styles. In a multiage or multigrade classroom, it simply becomes even more apparent. Teachers of multiage and multigrade configurations know how to differentiate for students, regardless of the grade level to which they are assigned. They are accustomed to teaching an overall unit of study to the whole class, while conferring with with individual students and teaching small groups to tailor their instruction. That is, in essence, what teaching multiage just is, making reading and writing workshop especially well suited for a multiage or multigrade classroom. First things first: What's the difference between multiage and multigrade? In daily conversation the two terms are often used interchangeably. However, researchers and nerds like me tend to use the two words differently. Multiage refers to a classroom composed of children who are more than one year apart in age, who aren't necessarily designated a grade level. Instead, the teacher differentiates instruction for each student according to their developmental, social, and academic stages -- regardless of age. In the United States, toddler and preschool classrooms are often organized this way--it is less common once kids arrive in kindergarten. Multigrade classrooms are just as the name sounds -- more than one grade level combined. Often multigrade classrooms are created not only for educational purposes, but also for practical purposes - to address low enrollment, or to immerse groups of less mature children in the positive behaviors and communication skills of the the older children (i.e. separate large groups with major behavioral issues into smaller groups). In multigrade classrooms, children within the classroom each are designated to a particular grade level, and move on to the next grade level each year. However, many of the same principles of differentiated instruction, and accommodations for developmental, social, and academic needs still apply. Children ideally "loop" with their teacher, meaning they stay with the same teacher (and some of their classmates) for more than one year. This consistency had numerous potential benefits -- so long as the child's relationship and experiences with the teacher and classmates are positive. Younger children, and children who have less experience outside of school with books, language, and literacy, are immersed in a classroom full of children who are older and potentially have more experience with books, language, and literacy. The older children (along with some younger children) model communication skills, vocabulary, and literacy skills that benefit the younger or less experienced students. Children develop connections with classmates across grade levels and classrooms, creating a school-wide community, a network of friendships and relationships that span across classrooms. Teachers in multiage and multigrade classrooms must be able to differentiate instruction for a wide range of ages, stages, and learning styles -- as all teachers must. The necessity of differentiation is just much clearer in a multiage setting. Researchers generally agree multiage and multigrade groupings are on par with single-grade level classrooms academically, socially, and emotionally. Some researchers have found positive benefits to multiage classrooms -- however those benefits are strongly tied to teacher philosophy, training, and implementation. The wonderful thing about the Units of Study series is that although the minilessons in every book may be geared to grade-level standards, they are actually multi-level in many ways, and are often quite transferable to more than one grade level. Even though the box may say “Grade 2” on it, in many cases it is quite easy to transfer many of the strategies up or down a level or two. If you teach multiage, you basically have the advantage of having twice as many units to pick from. Personally, I wish every teacher could have access to the grade above and the grade below sets of books, multiage or not. Of course, all of the principles I describe below would apply to any reading and writing workshop - even if you aren't necessarily using the Units of Study. For ease and efficiancy, however, I've written this advice for teachers using the series. The key is to make decisions based on students' actual writing and reading work, rather than their age or assigned grade level. When you put the "official" grade level aside and just see them as a group of kids with a range of needs, things come into focus. For example, a 1/2 class will have a wide range of readers & writers --- but so does any single- grade classroom. To plan a calendar of units for your school year, gather up as many various assessments and samples of student work as you can. Look to last year's teacher for the students who are new to your classroom. This might include running records, conferring notes, sample post-its or responses to books, published and "raw" writing samples, letter-sound identification, high frequency word recognition, spelling stages... everything you can get your hands on. Some people like to use a chart to organize all that data. Click here to see a few examples. 1. Consider adding or swapping out minilessons using a unit of study from one grade up or down. You might do this if you notice particular minilessons missing from the unit you've selected, but a more likely scenario is that you'll want to add to the minilessons that are already there, to give your children extra practice using other, similar minilessons from another unit. 2. Consider skipping or adding in "Bends in the Road." The Units of Study for Reading and Units of Study for Writing are all organized into 2-4 parts, called "Bends." Each bend is a string of lessons that fit well together. Organizationally speaking, they are quite easy to remove, add to, or swap. You might, for example, decide to do only the first two bends of a lower grade level unit, and then move over to the first two bends of a similar upper grade level unit. Or you might decide to do only the first three out of four bends of a more challenging unit. Or you might design your own bend to introduce a unit, before teaching the first bend as it is written. 3. You'll notice that within the Units of Study for Writing, there are always a few lessons in every unit introducing a checklist to help students set goals, self-assess, and reflect. There are similar goal-setting units in the Units of Study for Reading. With a multiage or multigrade classroom, you'll want to introduce more than one checklist so that each of your students is working from a checklist that is "just right" for them -- aim for a checklist that will allow the student to check "yes" to a number of items, but not every item - there should be some work to do on that checklist! In a 2/3rd classroom, for example, you may have a handful of students still working from the first grade checklist, groups using the 2nd grade, 3rd grade, and even a handful using the 4th grade checklist. You might decide to teach the checklists and rubric lessons via small group work instead of whole class. But what about the start of the year in a K/1 classroom? I don't have any student work to look at for my kindergarteners yet. You could use what you know about last year's kindergarteners to anticipate how much experience your incoming students might have had with books and being read to. You could reach out to families and preschools over the summer with a questionnaire, phone calls, or even home visits. Even a little bit of information about each child will be helpful in anticipating how best to launch your literacy year. Many K/1 classrooms tend to teach kindergarten units first, and then switch over to first grade mid-year -- Unit 1 in first grade will dovetail with Unit 4 from kindergarten. You might decide to use the nonfiction unit from the If/Then book instead of the first grade nonfiction unit depending on the time of year. The first two units for kindergarten are perfect for emergent readers but will not give your conventional readers the strategies they need for anything past levels A/B. The If/Then guide to instruction included in all of the Units of Study boxed sets is a great guide for your small group work. Look to If/Then Word Detectives unit if you need more print strategies for small group work early to mid-year. You could teach the minilessons that seem to apply to the biggest number of students in your whole classroom, but then get busy pulling small groups aside to differentiate. It'll be more important than ever to keep your minilessons "mini" so that you don't use up all your conferring and small group work time. Here are a few links to resources keeping your minilessons brief, engaging, and succinct. Should I always teach the same unit to my whole class? In general, research suggests that ability grouping doesn't pay off. The social aspects of learning together simply outweigh any potential reasons to split kids up - not to mention the precious minutes spent traveling from one room to another. Kids thrive on consistency and relationships -- with the teacher and the other students. So, sending one group out of the room (or to a certain part of the same room) to do something else while the rest of the class carries on is obviously not a great instructional model. However, I'm reminded of a challenge that we ran into this year with a 2/3/4 multiage classroom I work in. (Yes - that's three grade levels combined!) During persuasive/argument writing the team (two teachers) did decide to break into two groups - one group to write reviews & letters, and the other to study literary essay - the split was mostly 2/3 & 3/4 but there was a 4th grader or two that they kept with the reviews/letters group. In this situation, the decision to split was not necessarily along grade level groupings, and felt different from traditional ability grouping. Though they preferred to keep the class together, they decided to give it a try and seemed to be successful. What does a multiage or multigrade curriculum calendar look like? Take a look at the following examples from different first/second multigrade teams I work with. 1. In the both examples, the teams were new to reading workshop, and decided to launch with the first grade unit to support routines, volume, stamina, and to foster great book selection habits. 2. We also aimed to alternate between fiction/nonfiction reading, and we made sure to touch on narrative, informational, and opinion types of writing. 3. In the first example, the team knew that the first graders coming in, as well as the second graders, would benefit from some foundational skills teaching at the start of the year, so they selected 2nd Grade, Book 1, as their second unit of study, knowing that in this unit, they will be able to differentiate the type of word-solving and other foundational skills all of their students might need. They also liked that both of their first two units allow students to shop from the entire classroom library, which seemed like a great way to get started as teachers who are new to reading workshop, and have limited supplies of books. I often receive requests for example of various grade level configurations. Here are a few others that might serve as inspiration for you work with your colleagues: Disclaimer: None of these are meant as recommendations--only examples of how other schools have done this work. You absolutely must consider the needs of your students first, as well as your own familiarity with each unit. For example, some of these plans include test prep, which is not something that I necessarily endorse or recommend, but is a requirement for some schools. Over the past week this series has focused on suggestions for organizing beautiful classroom libraries. Each day this week, I posted suggestions for each grade level, based on the Units of Study for Teaching Reading by Lucy Calkins et al. (which I am honored to have played a role in creating). No matter the grade level, a classroom library can be a place that inspires children to fall in love with books and words. The library should be brimming with a range of text types, topics, and styles. Just as your students grow and change across the school year, so will your classroom library, reflecting the personalities and changing interests of the children in the room. Think outside the box to invent ways to display books, celebrate favorites, highlight new arrivals, and share your own love of reading as a model for your students. You might use a type of leveling system to assist kids in finding books - dots on the covers, or letters written on the back, but these need not be the main feature of any classroom library, at any grade level. Rather than shelves of books organized by level, you might instead highlight bins filled with favorite authors, topics, themes, genres, character traits, and other, more enticing ways of encouraging kids to choose a book they really want to read. Inside these bins of books, there may be dots or letters to assist you and the children in finding what you need. It will be far more important that kids open up each book and try things out, deciding for themselves if the book feels like a good fit. Choice is a key component to successful reading, no matter how young or old. Across the grades, classroom libraries can provide a window for students into diverse perspectives, time periods long ago, and places far away. At the same time, your library provides a mirror--a place where children see their own situations and familiar settings reflected in books. Author Grace Lin spoke eloquently about the importance of windows AND mirrors in her recent TEDx talk. If you haven't seen it yet, be sure to watch it soon. I do want to say (again, and again) that there is one thing that all of the books in the world cannot replace: You! No matter how how many books you have in your classroom library, it is your love for books, and your dedication to teaching reading that is crucial. While having an amazing classroom library is incredibly helpful, there are many ways to make the best with what you have, adapt, stretch and still have an engaging and successful reading workshop. This series will suggest some goals to aim for, and you and your colleagues can work together to figure out what makes sense for your team. Thank you to Katie LeFrancois, Kathleen Sokolowski, Anna Gratz Cockerille, and PS 199Q for the photos of beautiful classroom libaries! If you're just joining me, over the past week this series has focused on suggestions for organizing beautiful classroom libraries. Each day this week, I posted suggestions for each grade level, based on the Units of Study for Teaching Reading by Lucy Calkins et al. (which I am honored to have played a role in creating). In previous posts I outlined suggestions for: kindergarten, first grade, second grade, third grade, and fourth grade classroom libraries. Today I have suggestions for fifth grade. Fifth graders are a delight to work with. They have an awareness of what others think, are developing their own opinions about important issues, and often passionately concerned about justice and fairness. They sometimes seem so grown-up, but deep down many of them are still drawn to stories with animals as main characters and love silly humor. They often have a craving for fairy tales and fantasy, for singing songs, and being read-aloud to. For fifth graders, books can be simultaneously serve as a way into young adulthood, and a way to escape it. Your fifth grade library can reflect the interests, personalities, and needs of the young people who will be reading from it. Across the year, baskets of books can rotate in and out of the library to support the work of each particular unit, and keep kids interested in finding new books. Throughout the year, your library will be filled with fiction or nonfiction books to match the range of reading levels and interests of your fifth graders. Dividing your library into two halves - fiction and nonfiction will help you organize for upcoming units and manage book shopping more easily. During a fiction unit, you can simply pin a curtain over the nonfiction half. During nonfiction units, the curtain can come down to reveal fresh nonfiction titles. As you build your collection, be conscientious about the groups who are represented on the shelves of your classroom library, analyzing through many lenses. How racially diverse are the main characters in your books? Are there both male and female protagonists? How do the characters in your classroom library defy stereotypes (or not)? Is there a diverse representation of families, lifestyles, traditions, socioeconomic status, disabilities, and characters of all shapes and sizes and walks of life - in both fiction and nonfiction? Consider this always a work in progress. If you're not sure where to begin, the official site of the #weneeddiversebooks campaign is a good place to begin to educate yourself on the need for more diverse books, and where to find them. The publisher, Lee and Low Books, specializes in multicultural books for young readers, and their website and blog are a terrific resource for learning more. Traditionally, a classroom library might be organized by baskets of leveled books. However, I want to encourage you to go beyond baskets marked by reading levels. Of course, you might have a few baskets marked this way for convenience, but you may want to downplay levels and instead highlight baskets filled with favorite authors, topics, themes, genres, character traits, and other, more enticing ways of encouraging kids to find a book they really want to read. It is said that books can serve as "windows, mirrors, and sliding glass doors" (Bishop R.S., 2015 ). Your fifth grade library can provide a window for students into lived experiences from a wide range of perspectives. Through books they are offered a glimpse into many cultures, time periods, and other worlds, while at the same time books can provide a mirror--a place to see their own identities and familiar experiences reflected back to them. Author Grace Lin spoke eloquently about the importance of windows AND mirrors in her recent TEDx talk. If you haven't seen it yet, be sure to watch it soon. For this unit, look for books that lend themselves to meaningful thinking and conversation. It will be incredibly useful to organize books for this unit by themes or issues that characters face, so that clubs can easily make plans to read multiple books on one theme, allowing them to compare and contrast, and think deeply about how different characters experience similar themes or issues. Some of the suggested themes might include issues of cultural differences, overcoming obstacles of all kids, fitting in, loneliness, loss and grief, family struggles, race and identity, growing up, healing emotional wounds, and others. In any club unit, it's ideal to have multiple copies of each title, so that partners or groups of kids can read and talk about the same book. However if you are short on books, you can scrape by with kids reading individual books and then swapping with a partner. Remember that depending on the length of the text, you can plan on clubs reading approximately a book a week (a week and a half at the most). This unit builds nicely off of the work your students may have done in the fourth grade character unit (Fourth Grade Unit 1, Interpreting Characters: The Heart of the Story). In fact, you may be able to borrow or share books with your fourth grade colleagues to provide more choices of titles. Chances are, you will have some titles that you aren't using and so will they. In some schools, all the best multiple copies of books with strong characters and themes are placed on rolling carts so they can easily become a rolling library to be shared from classroom to classroom. For this unit, you may want to pin a curtain over the fiction side of your library, or swap the books out to create excitement over the nonfiction books your kids will be reading. You will want the shelves of the nonfiction half of your classroom library to be pouring with high interest, engaging informational texts. Put out information books of all types of text structures, with all kinds of engaging features. Organizing books into bins based on topics (rather than levels) will help your students find books on topics they are curious about. The books inside the bin might be marked with a dot or a letter, or some other marking, to assist students in finding a book they can read with accuracy, fluency, and deep comprehension -- but it will be important that students go beyond the sticker. They'll need to open books up and read a few pages to truly get the sense of how challenging the text will be. In this unit, your student will be reading as many sources as they can to research debatable issues like deep sea versus outer space exploration, the benefits versus the risks of extreme sports, animals in zoos, and the pros and cons of plastic bags. The authors of the Units of Study for Teaching Reading have made some text sets available in the digital resources that come along with the units, so all you'll need to do is print them out and get them organized, along with additional books and texts that you'll want to add to the online starter sets. For organization, you may want to compile the articles and other printed resources for each topic into packets that students can have for their own, to reread often, highlight and mark up. Each club can store their packets, books and other materials in a shared bin, so that everything they need for studying their topic and preparing for debate is in one container. In addition to the texts students will be reading to research their chosen issue, you might have students shop for one additional book, one that is purely their choice, fiction or nonfiction, to keep their personal reading lives alive and well. This is a unit that you and your students will look forward to all year long. In this unit, your students will work in reading clubs to read a fantasy series of their choice. The goal is for them to read an entire series, or as many as they can, across the unit. You'll want to scour your classroom, as well as your school and community library to pull together as many books as you can for kids to choose from. Keep in mind that the first book in any series is most important, so prioritize those. If you are short on books, you can still have a very successful unit of study. One option would be for partners of students (instead of clubs) to each read one fantasy book and then swap. Another option would be to adapt the unit so that students read individual fantasy titles, rather than series -- of course, you can group similar stories and characters, or books that contain similar themes, or elements, so that they are somewhat like a series, and kids can still do most of the work of the unit. If you're just joining me, over the past few days, I've been writing about ways to organize beautiful, engaging classroom libraries. Across this week I'll provide suggestions for each grade level, based on the Units of Study for Teaching Reading by Lucy Calkins et al. (which I am honored to have played a role in creating). In previous posts I outlined suggestions for kindergarten, first grade, second grade, and third grade classroom libraries. Today I have suggestions for fourth grade. Fourth graders are becoming increasingly aware of themselves and the world around them. They're beginning to develop an interest in how other people think and live, and are curious about other time periods, and people around the globe. They are generally interested in discovering the whole wide world. Your fourth grade library can provide a window for students into other lives, other time periods and other worlds, while at the same time providing a mirror--a place to see their own situations and familiar settings reflected in the story. Author Grace Lin spoke eloquently about the importance of windows AND mirrors in her recent TEDx talk. If you haven't seen it yet, be sure to watch it soon. Be conscientious about the groups who are represented on the shelves of your classroom library, analyzing through many lenses. How racially diverse are the main characters in your books? Are there both male and female protagonists? How do the characters in your classroom library defy stereotypes (or not)? Is there a diverse representation of families, lifestyles, traditions, socioeconomic status, disabilities, and characters of all shapes and sizes and walks of life - in both fiction and nonfiction? Consider this always a work in progress. If you're not sure where to begin, the official site of the #weneeddiversebooks campaign is a good place to begin to educate yourself on the need for more diverse books, and where to find them. Traditionally, a classroom library might be organized by baskets of leveled books. I want to encourage you to go beyond baskets marked by reading levels. Of course, you might have a few baskets marked this way for convenience, but you may want to downplay levels and instead highlight baskets filled with favorite authors, topics, themes, genres, character traits, and other, more enticing ways of encouraging kids to find a book they really want to read. Across the year, baskets of books can rotate in and out of the library to support the work of each particular unit. This has the added benefit of keeping the library fresh and new. Throughout the year, your library will be filled with fiction or nonfiction books, and sometimes a mix to match the range of reading levels and interests of your fourth graders. Dividing your library into two halves - fiction and nonfiction will help you organize for upcoming units and manage book shopping more easily. Last, but not least, I must say that all the books in the entire world cannot replace replace YOU. I've said it before: It is your love of reading, and your dedicated teaching that will make or break a successful reading workshop. You can always adapt, make due with what you have, beg, borrow, and steal what you need to get great books into your students' hands (well, hopefully not steal... but you know what I mean). Where there's a will there's a way. My hope is that you'll use these posts to set goals, and work together with colleagues to make a plan. You'll want your classroom library to be spilling over with great characters for this unit. Any books with characters will do -- however, some books will lend themselves to deeper character analysis and interpretation much more easily than others. Realistic fiction books tend to have the most well-developed characters, and tend to be the most supportive in terms of the work in this unit: character development, character change, complex relationships, lessons, and theme. You can also search your library for mysteries, fantasy, and adventure stories with strong characters. While easier non-realistic genre-fiction tends to be more plot-driven, levels P+ often offer characters that are complex and interesting--perfect for this unit. You'll find that this unit builds nicely off of the work of the third grade Unit 3 (Character Studies). Depending on the time of year and reading levels of your fourth graders, you might look into borrowing books with strong characters from your third grade colleagues (books that they likely won't be needing until later in the year). For this unit, you might organize the fiction half of your library into bins by author, series, or similar styles (ex. funny, books that make you think, books in poem form, short story collections), or by character (ex. tough as nails, introverts, reluctant heroes), or perhaps by theme (ex. loneliness, coping with loss, bullying, overcoming obstacles). For this unit, it's ideal to have multiple copies available (especially starting in Bend II) so that partners or groups of kids can form clubs to read and talk about the same book. However, the unit can also be successful with kids reading individual books and then swapping with a partner, or simply reading on their own. Remember that depending on the length of the text, you can plan on kids reading any where from a book a week (level R+), to 2-3 books a week (N-Q), or even 6-8 books a week or more (G-M), so you will want to collect a lot of books so that kids will have plenty to choose from. For this unit, you may want to draw a curtain over the fiction side of your library, so as to highlight bins of gorgeous nonfiction. In the first part of the unit, you might arrange your library with bins of a wide range of high-interest topics. Anything from different types of animals, to extreme sports, to Star Wars, to space exploration. Gather books on the topics your particular students are passionate about. DK and National Geographic are two publishers that consistently create beautiful, engaging nonfiction books. In a perfect world, each student would fill a personal book bin or baggie with 3-4 books on a topic, and that is what they would read. If books are in short supply, however, you might compile books in to bins for groups of 4-5 students to share for the week instead of every student having their own private supply of books. Over time you'll want to add to your collection to make it possible for students to hang on to the same books for a week, allowing for rereading, gathering post its, and placing books side by side more easily. After spending some time researching topics of their own choosing, students will then form clubs and select a topic related to extreme weather and natural disasters. To support this work, you'll need a set of additional nonfiction topic bins, for example: tropical storms, floods, icing, winter storms, earthquakes, volcano eruptions, lightning, just to name a few. The more specific the subtopic, the more easily your students will be able to carry what they learn from one text to the next, compare and contrast, and have interesting conversations. Each club can share a bin of texts, so long as the bin contains accessible texts for every student in the group. Gathering a wide range of leveled texts on many subtopics, all related to extreme weather and natural disasters is a big challenge. If your are concerned about having enough books, consider expanding the topics to be a bit more broad: cold weather events, hot weather events, events on land, and events at sea, for example. You can give students more options by encouraging them to select books from a range of levels (they can always read books easier than usual -- but should never be required to read something that is too hard). Add in magazine articles, news stories, and other sources if possible. You might consider supplementing the books you have with short (3-5 minute) video clips and digital resources from trusted sources such as National Geographic, Pebble Go, and Time for Kids. In an extreme book shortage, you might divide your workshop into two parts: a certain amount of time each day to read weather and disasters, then switch over to fiction books. This will help stretch the nonfiction books across the week. Another option is to adapt the unit to spend more time reading a range of high interest topics, and less time in weather and disaster. I should say from the start, that depending on your resources, as well as the demands of your social studies curriculum, you may decide, in the end, to swap out American Revolution for another historical time period or topic. But before you make that decision, know that most people I know who have tried adapting the unit agree that teaching the unit as it is written is well-worth it. It is ultimately your decision, along with your team, but in many cases, teachers have liked this unit well enough that they've simply decided to teach the American Revolution in addition to the school/district social studies curriculum! In the first bend of the unit, students will first read widely about the American Revolution. Then, a few sessions in, they'll choose a subtopic to research more deeply. To support this work, you can organize bins of texts related to a wide array of American Revolution topics. Include nonfiction trade books, as well as maps, photographs, poems, songs, and artwork to immerse kids in the language and vocabulary, as well as the images and sights of the time period. Work to include multiple texts on each subtopic (i.e. soldiers, battles, children in the revolution, women in the revolution, Paul Revere's ride, etc.). If you're ordering books, you'll find that there are hundreds of well-written, engaging books related to the American Revolution, right around fourth grade reading levels. The book distributor Book Source is a great place to search for and find books for this unit. By the second bend, you might drop in a few new texts to each group's bin of texts to foster engagement and interest, as they prepare for debates. Aim to include texts on each subtopic from multiple perspectives (i.e. the British versus Americans, or women versus men, or Patriots versus Loyalists whenever possible. Consider gathering texts for this unit a long-term project, with each school year getting better and better. In the third bend, each group of students will move on to a new subtopic. You may be able to simply swap bin from one group to another if there is a wide enough range of reading levels contained within each bin. Or you may have several new bins of material for students to choose from. Students can always read materials that are easier than their "just right" reading level, but should not be reading texts that are too difficult to make sense of, or are frustrating, or un-engaging. This unit will be the culmination of all the character work and informational reading skills your students have learned this year. You'll want to reorganize your classroom library to support historical fiction by creating bins of books from time periods. Ideally you would select several time periods and gather multiple copies of books at various levels for each club to choose from, so that each club is reading within one time period or even one aspect of a time period. Each club will likely read about one or two books per week. For example, one club, reading about Japanese and Japanese Americans' experience of WWII across the unit, might read Baseball Saved Us, by Ken Mochizuki followed by The Faithful Elephants, by Yukio Tsuchiya, then Sadako and the Thousand Paper Cranes, by Eleanor Coerr, and finally Hiroshima by Laurence Yep. In a perfect world, there would even be additional stories to choose from, so that students still have choice over the books they read, even within the boundaries of one historical time period. Ideally, you would also add one or two easy informational texts, video clips, or other resources to each time period collection to give additional background information. You can plan for a range of levels in each time period bin--kids will be taught the strategy of reading the easier chapter books and picture books first, then working up to the more challenging books. In fact, because of the added challenge of a different time-period, encourage kids to be even more careful than usual when selecting books -- and know not to be surprised if your kids select historical fiction books that might be a level "down" from their usual realistic fiction level. Be sure to compliment their wise decision making. If you are short on books, you can still teach a very successful historical fiction unit, making due with what you have. Organize the books you do have into time periods as best you can and make a wish list of books you'd like to add to your collection. If you don't have multiple copies, clubs won't be able to read the same book at once, but partners can each choose one book, and swap when they are done so that they will both have a book in common. While ideally kids would stick to one time period to help build a deeper understanding, they could switch time periods if you don't have enough books--or if they have little interest in the books you do have. Better to encourage students to select books they want to read than to rigidly require they stick to a time period. As you build your collection aim for diverse perspectives from each time period, with a wide variety of main characters. Look for racial diversity, varying gender perspectives, diverse family structures, political and national identities, socioeconomic groups, religious groups, a range of lifestyles, and abilities. If you're ordering books, Lee & Low Publishers, for example, specializes in publishing beautiful multicultural books for kids. Aim for main characters in each time period in all shapes and sizes, from all walks of life. Welcome back to my classroom library series! In this series, I hope to provide advice for organizing beautiful, engaging classroom libraries to support reading workshop. Across this week, I will share suggestions for each grade level, based on the Units of Study for Teaching Reading (which I am honored to have been a part of creating). In previous posts I outlined suggestions for kindergarten, first grade, and second grade classroom libraries. Today I have suggestions for third grade. I do want to say (again) that there is one thing that all of the books in the world cannot replace: You! No matter how how many books you have in your classroom library, it is your love for books, and your dedication to teaching reading that is crucial. While having an amazing classroom library is incredibly helpful, there are many ways to make the best with what you have, adapt, stretch and still have an engaging and successful reading workshop. This series will suggest some goals to aim for, and you and your colleagues can work together to figure out what makes sense for your team. With that said, think of your third grade classroom library as a tool for making kids fall in love with reading. Picture how you will display books, recommend titles, and draw kids in. Your classroom library isn't simply a place for book storage -- it's a place to put books on display, highlight favorites, celebrate new arrivals, and broadcast your own love of reading as well as the kids'. Think about ways to make your classroom library inviting and attractive -- a place in your classroom that kids want to be. Across the year, baskets of books can rotate in and out of the library to support the work of each particular unit. This has the added benefit of keeping the library fresh and new. Throughout the year, your library will be filled with fiction or nonfiction books, and sometimes a mix to match the range of reading levels and interests of your third graders. Dividing your library into two halves - fiction and nonfiction will help you organize for upcoming units. Many teachers simply pin a curtain over the half of the library not currently being used, to manage book shopping more easily. This unit is designed to get kids hooked on books, and in the spirit of things, you'll want to search out all your best, most engaging, enticing, beautiful, funny, meaningful, and exciting books. Look ahead to your upcoming units -- you will want to save your nonfiction for Unit 2 and Unit 4, and you may want to save your best realistic fiction series books and character books for Unit 3 (though you might sneak a few of those books out if you know they'll hook a reader). That means this is the perfect unit to arrange baskets of mysteries, fantasy, historical fiction, sci-fi, graphic novels, picture books and chapter books to match the range of reading levels your third graders will need access to. Take full advantage of the chance to encourage kids to read humor and action stories. Look for high interest books that you know will get kids looking forward to reading workshop. Hook them with your best stuff! Chances are, when you were a kid, you learned to "skim and scan" nonfiction books to collect facts -- often in the name of research for an assignment or a project. This is not that kind of reading. In this unit, kids will be filling their book bins or baggies with beautiful nonfiction books and reading them, cover to cover. Traditional reference books, textbooks, encyclopedia-ish types of text and the like won't work well in this unit. Nonfiction books for children have come a long way in the last two decades, and it isn't difficult to find engaging, rich informational texts that kids want to read. Publishers like DK and National Geographic publish gorgeous nonfiction series books for every reading level. Aim for a wide range of topics to suit the interests of the kids you teach - everything from animals, pets, plants, and nature, to monster trucks, outer space, extreme sports, and Star Wars. In this unit, your aim will be to gather as many different individual titles as possible -- unlike other units, the emphasis here is not on reading one topic, or necessarily reading the same text as partners (that comes in Unit 4). Nonfiction tends to be more difficult for some readers, so you may want to especially focus on gathering easy just right books - ideally enough books for every reader to have 5-6 new books per week, depending on the length of the text. It's common for students to find just right nonfiction books that are one or even two levels "down" from their fiction just right books -- but it all depends on the topic, vocabulary, and reader interest. In the third bend, you'll teach kids strategies for reading narrative nonfiction. For this part of the unit, you might want to make it easy for kids to find those books in the classroom library by creating bins designated for narrative nonfiction, so that students won't have to search the entire nonfiction half of your library for narrative text structures. If nonfiction books are in short supply, you might arrange baskets of books for groups of students to share, instead of each student having their own 5-6 books. You can also use the nonfiction you might have otherwise saved for Unit 3 to bulk up the baskets and give kids more choices. Magazines and online resources (I rather like Pebble Go) can also be used to bolster your nonfiction collection - though these do tend to be more challenging for readers. In this unit, you can pull the curtain down from the fiction half of the library to reveal baskets brimming with strong characters and series books. Keep in mind that often genre-fiction, like mystery and fantasy, at typical third grade reading levels (M/N-P/Q) tend not to have very well developed characters. These books work great at the start of the year for hooking readers and for plot work, but they aren't ideal for deep thinking about character development, character change, complex relationships, theme or lessons learned. Realistic fiction books and series tend to have better developed characters. You might organize books by author, series, or gather up similar types stories into bins (ex. adventure stories, school stories, characters who overcome obstacles, sports stories). You might organize some baskets by style (ex. funny, books that make you think, books in poem form, short story collections), or by character traits, even (ex. tough cookies, overcoming shyness, super smart characters, goofy). For this unit, it's ideal to have multiple copies available so that partners or groups of kids can form clubs to read and talk about the same book. However, in a pinch, the unit could also be successful with kids reading individual books and then swapping with a partner, or simply reading on their own. Unit 4: Research Clubs: Elephants, Penguins, and Frogs, Oh My! A main feature in this unit will be reading multiple books on one topic to build content knowledge and vocabulary, compare and contrast sources of information, and to read increasingly difficult texts. As such, you'll want your classroom library to support this work by creating sets of nonfiction books. It's highly recommended that you gather books about animals, since many of the reading skills will model using animals as an example. However, you could conceivably teach the unit using animals as your example in minilessons, with kids transferring those skills to books about any topic. Fortunately, for many of us, nonfiction animal books aren't very difficult to find! What is a challenge, however, is gathering books that kids can read with ease, fluency, and deep comprehension. You can combine 3 levels of books in a topic basket, to stretch your resources, so long as each student is matched up with basket of books that is either just right, or easier -- never too hard. Whether you are ordering books, or gathering books from the school or community library, select the animals that seem interesting to your students or connect with your science curriculum, then find 15-20 titles about each animal, keeping in mind you'll need multiple titles at each reading level range. 15-20 books will be enough for a group of 4 or 5 students to share for about a week. Then do that for as many animals as possible, to offer as many choices of animals as you can to each group of students. You'll need a minimum of 3 different animal baskets for each book club (one for each bend of the unit) -- but keep in mind some baskets can be swapped from one group to another. Multiple copies of each title in the basket cold be used, but really are not necessary. Kids could read a book, put it back in the basket for another member of the club to read, and in a short time they all will have at least one book in common to talk about. If books are in very short supply, consider making your topics broader (sea creatures instead of sharks, for example), or broadening the range of levels in each baskets (levels J-M instead of J/K), and making the clubs a little bigger (5 students instead of 3-4). If this is the case, make it a goal to build your collection over time and make use of school and community resources to provide more books on each specific topic, and better fit in difficulty levels, so that you can have fewer students in each group. In this series, I hope to provide support with organizing beautiful, engaging classroom libraries to support the Units of Study for Teaching Reading by Lucy Calkins and Colleagues (of which I am honored to have had a role in coauthoring). Over the next several weeks, I'll lay out suggestions for each grade level. I began with kindergarten. Yesterday, I addressed first grade. Today's post is for second grade. A second grade classroom library should reflect the personalities and interests of the children in the room. Baskets of books might be labeled, "Disgusting and Gross Things!" or "Fairies and Princesses" or "Extreme Sports" or "Adorable Baby Animals" or "Our Favorite Authors." Inside these high interest baskets, kids will find books that are just right for them. You might use a type of leveling system to assist kids in finding books - dots on the covers, or letters written on the back, but these need not be the main feature of the library. It will be far more important that kids open up each book and try it out, deciding for themselves if the book feels like a good fit. Across the year, baskets of books can rotate in and out of the library to support the work of each particular unit, while also keeping the library fresh and new. Throughout the year, your library will be filled with fiction or nonfiction books, and sometimes a mix to match the range of reading levels and interests of your second graders. Dividing your library into two halves - fiction and nonfiction will help you organize for upcoming units and manage book shopping more easily. In this unit, you can anticipate that each child will read approximately 6-8 books per week. This means if you have five kids reading at a particular level, you'll need a bare minimum 30-40 books at that level. Ideally you'll gather 3 times that many for each level, so that kids will have books to choose from, and your classroom library won't be completely empty every time kids shop for books! The Growth Spurt unit is not genre-specific, meaning kids can shop for books to fill their book bins or baggies from both the nonfiction side of your library and the fiction side. If books are in short supply, you could scrape by with one basket of books for a group of students to share, rather than each student having their own books for the week. This, of course, is not ideal, but will make it possible to teach the unit with fewer books until you're able to build your collection. In every unit, you'll want to rearrange the library to reflect the unit of study, and to spark new interest. As such, for this unit you'll probably want to close the fiction half of your library to highlight the nonfiction books. Ideally, you'll organize these books into topic baskets, so that students can shop for multiple just right books on one topic, allowing them to practice carrying questions and ideas from one book to the next. It is a common issue that many schools have a nonfiction book shortage. If this is the case in your classroom, you are certainly not alone! You can make the best of what you have by having groups of children share a basket of books on a topic, rather than each student having their own supply. Or, instead of each student having six books in their book bin, perhaps each student selects two books for their topic, and fills the rest of their book bin with other topics. When nonfiction is in very short supply, you might decide to have part of the reading time be devoted to nonfiction reading, and then switch halfway through to fiction or mixed-genre reading. If this is the case, it might make sense for each student to have two baggies - one for nonfiction, and another for the mix of books to read when it's time to switch. This is another unit where kids can shop for both fiction and nonfiction. That means the fiction half of your library can be reopened--hooray! In fact, now that you've taught an entire nonfiction unit, you might encourage kids to shop for half and half. With the series book clubs coming up, you will probably want to go through your library before you open the fiction section, and set aside as many series books as you can, saving them for Unit 4. As the title of this unit suggests, your students will be reading lots and lots of wonderful series books in this unit. Your kids will love diving into beloved series books like Horrible Harry, and Pinky and Rex, and Magic Treehouse and Marvin Redpost. The trick to this unit is to have plenty of choices of books, while at the same time teaching kids to agree on a series to read together with others. Ideally for each series, you would have multiple copies of each of the first few books in the series, in a row, without skipping around. You'd have a variety of series at each level for each club to choose from as well. However, things aren't always ideal, so if you must, you could get by with just one copy of each book in the series. If you can't get all the books in a given series, know that of all the books in the series to have, the first book is the most helpful. Usually it is the first book where characters are introduced most clearly, where the setting is developed, and other important groundwork is laid. It is also possible to do the work of this unit using books with strong characters that aren't necessarily part of a series. You might gather books featuring characters with similar traits to read like a series. For example, When Sophie Gets Angry (Molly Bang), The Recess Queen (Alexis O'Neill), and Sheila Rae the Brave (Kevin Henkes) all feature characters with a few things in common. You can offer more choices for your readers by thinking creatively about the characters in your library and grouping them together into bins. Students will have better, stronger conversations when they've read the same title, but they can get by with talking at least about the same characters. If you don't have many multiple copies, you can teach kids to read a book, then swap with their club members so that after a day or so, they've all read at least one book in common. In this series, I hope to provide support with organizing beautiful, engaging classroom libraries to support units of study in teaching reading. Over the next several days, I'll lay out suggestions for each grade level. Yesterday, I began with kindergarten. Today, I'll address first grade. A first grade classroom library should be a place that inspires kids to want to read. It should be brimming with beautiful and interesting books that kids can read all by themselves. Across the year, baskets of books might rotate in and rotate out to support the work of each particular unit, while also keeping the library fresh and new. Throughout the year, your library will be filled with fiction or nonfiction books, and sometimes a mix to match the range of reading levels and interests of your first graders. Yes, your library will be brimming hundreds of little leveled books (even thousands if you're lucky) -- but aim for books with beautiful illustrations on high interest topics. Dividing your library into two halves - fiction and nonfiction - will help you organize for upcoming units and manage book shopping more easily. For the nonfiction half of your library, it isn't difficult to find lots and lots of little books about animals, families, school and food. On the fiction side of your classroom library, you can find many, many about friendship, play, games, and funny little stories about characters like Mrs. Wishy Washy, Huggles, Biscuit, and Piggie and Elephant. Candlewick Press, Lee & Low Books, and Pioneer Valley are just a few publishers providing lovely, engaging little books that are just right for first graders. In this unit, you'll need to stock your library with a mix of fiction and nonfiction books that match the range of levels of your readers. In many first grade classrooms, this includes everything from level A to H and even sometimes levels J/K/L even at the start of the school year. It's a great idea to add just a few baskets to the classroom library each day for the first week or two of school, until all the baskets are out, inviting kids to help you label the baskets, and highlighting some of the exciting books they may want to read. While labeling your books with a dot or a letter will help you to find books when you need them, you need not limit the library to shelves full of bins labeled "A," "B," and so on. Instead, you might take those leveled books and organize them by topics, interests, characters and authors. Inside each basket will be a mix of levels (perhaps with dots or markings on a number of them, but probably not all). This way you can teach kids to "shop" the library thinking first about what they might want to read, then second about testing out the difficulty. Remember that at this stage, the books are very short. Ideally each week students will select their own 10-12 just right books in their book bin or baggie, plus the extra books you introduce in guided reading sessions. This means, if there are five children who read the same level, you need at least 50-60 books at that level. Ideally you'd have 3-4 times that many at each level so that kids have choices about their books and so that your library isn't cleaned out every time kids shop for books. "That's a LOT of books!" you might be thinking. Yes. It is. It is a LOT of books! In a pinch, you could combine whatever books you do have into a basket that children can share, instead of having each child shop for their own book bin or baggie for the week. This is less than ideal, but it could get you through the units until you are able to gather more books for children to read. In this unit, you'll need to rearrange your library to support the work of the unit -- which is nonfiction reading. You probably won't want kids to have to sift through the fiction, poetry, and other books to find the ones that will help them do the work you're teaching. To support kids, you can swap your library over to nonfiction only -- with perhaps a basket or two of high interest fiction to read outside of reading workshop. If your library is already divided into two halves, you can easily close the fiction side of the library by pinning a curtain over it. During school library time or choice time, of course, kids can read and browse anything they like. To help kids explore all the books in the nonfiction library, and to breathe new interest into nonfiction books that may have been out since the start of they year, consider reorganizing the nonfiction side of the library by inviting kids to create new baskets. Place mixed baskets of nonfiction around the room and invite kids to work together to make little stacks of books they think fit together into categories. They might come up with books about vehicles in one stack, books about bears in another, and yet another about weather. Then the kids can place their stacks into baskets for the classroom library and make their own labels for the baskets. For this unit, kids might be reading fiction or nonfiction -- they can do the work of the unit using either or both! Now is the time to reopen the fiction section! However, you might want to remove your best character books, to save them for Unit 4 (see below). In this final unit, kids will be most successful if they are reading books with great characters, so you'll want to put a curtain over the nonfiction half of your library. Of course, when it comes to beginning reading, not all books contain well-developed characters -- it goes with the territory that sometimes the characters are very simple, even too simple for this unit. You'll want to weed out the pattern books where, yes, there are "characters" in the picture but they don't really do anything. "Red sock, green sock, blue sock, yellow sock" isn't going to give kids a lot to work with! You could put aside the books that won't make the work any easier and save them for next year's Unit 1 and Unit 3. Candlewick Press and Pioneer Valley are two publishers where you can find lovely little leveled books that come in character series, at even the most beginning levels, perfect for doing the work of this unit. I'll admit it. I have a bit of an obsession with classroom libraries. I think it all began as a new teacher, and as a staff developer in classrooms where zero books were provided. I learned how to scrimp and save points, get donations, and shop yard sales to find books for my classroom, as well as my colleagues' classrooms. I made due with what I had, and learned how to keep a detailed wish list. I'm sure some of you know exactly what I'm talking about. As part of the team of coauthors on the Units of Study for Teaching Reading (by Lucy Calkins, et al), I spent a lot of time studying classroom libraries to support young readers. In this series of posts, I hope to provide support with organizing beautiful, engaging classroom libraries to support units of study in teaching reading. Over the next several days, I'll lay out suggestions for each grade level (K-5), but I do want to say first that all of the books in the world cannot replace a great teacher. No matter how beautiful your classroom library is, you still need to model, daily, a love for books, and a passion for teaching reading. While having a great classroom library is incredibly helpful, there are ways to stretch the resources you have, make adaptations, and do a bang up job of it. I'll lay out goals to aim for, and together with your colleagues you can figure out what makes sense for your team. A kindergarten classroom library should be a place that inspires young children to fall in love with books and words. It needs to be inviting and child friendly. The library should be brimming with a range of text types, topics, and styles. Just like the children who use the library, the kindergarten classroom library will grow and change across the school year. At the start of the year, for example, the library will be chock full of books that are accessible to even the most emergent of emergent readers. Concept books, board books, emergent storybooks, small copies of books made by the children, and more will fill the baskets and shelves at the start of the year. As the year goes on, small copies of familiar big books, songs and poems, and eventually leveled books will find their way onto the shelves. This unit begins by offering student concept books, beautiful picture books (nonfiction and fiction), and other engaging texts for children to browse and look at. Concept books might include alphabet books, shape books, colors, opposites, counting books, and label books. Depending on how many books you have, you might put all of these into several bins in your library organized by text type, or you might be able to create a bin of these types of books for each table or group of children. Often people add in a few beautiful picture books for children to admire and study the pictures, and to storytell across the pages. The goal is to provide books that even a very emergent reader can pick up and enjoy without needing very much prior knowledge, and certainly not needing to know anything about letters and sounds. In this unit, you'll also need multiple copies (ideally 4-6 copies) of emergent storybooks. These books are very important (see this post for details). These are books such as Caps for Sale, Three Billy Goats Gruff, and The Three Little Pigs. Many teachers mark these books with a star-shaped sticker and call them "star books" to distinguish them from other books in the library, and to make it possible for children to put the books back where they belong (in the baskets marked with stars, of course). An easy way to manage and organize the star books is to create one basket of star books for each table or group of children, and fill each basket with a mix of star book titles. The baskets live on the shelves of your classroom library, and each day, at the start of reading workshop, a table captain for each group places a basket of star books on the tables for kids to share. Another way to go is for each child to have their very own book bin (or baggie) and for children (not adults) to select one or two star books for their own book bins each week. In this unit, children are beginning to develop strategies for attending to print, first in very familiar shared reading books that have been read again and again with support from their teacher and classmates, and eventually using less familiar (but still very predictable) patterned texts that have been introduced with quite a bit less scaffolding than the shared reading texts. To support that work, an ideal classroom library would continue to hold the wonderful emergent texts and concept books from Unit 1, but would expand to include many small copies of the big books, songs, poems, and other shared texts that the children have read together as a class many times. Ideally, you will plan ahead for this, by gathering (or making) small copies of your big books from Day 1 of school, and by creating small versions of the charts and poems you have on chart paper. Ideally you would have set aside some time, every day, to read and reread big books, songs, and poems so that by the time you get to Unit 2, your kids have quite a repertoire of texts that you've worked on! In addition to the copies of shared reading texts, you'll be introducing beginning leveled books to groups of children who are ready. This means, your classroom library could include baskets of leveled books (especially levels A & B). This doesn't mean you have to write a giant letter "A" and "B" on the front of all your leveled baskets. You might have one or two baskets marked with a level for convenience, but the majority of your leveled books could be organized by topics and interests. Many books at these early levels fall into several categories. Books about family, school, play/games, and food are common. Books about animals, vehicles/transportation, and toys are also fairly easy to find. Some publishers, such as Candlewick Press and Pioneer Valley, offer lovely little character series books, even at the earliest levels, so you might have baskets of characters, or even authors, as well. If you are moving into this unit, it means many of your children are likely reading levels A and B (which is nearly but not quite conventional reading), and might be moving into levels C and D (which is much closer to conventional reading). Your students still benefit from and need book introductions to most unfamiliar texts, but with a little support can read these books independently. You'll want to either add or swap out fresh baskets of leveled books, to provide new challenges and plenty of choices of lovely little books for your readers. Some teachers might feel pressure to put away emergent storybooks and shared reading texts at this time, finding that kids are too tempted to fill their book bins with books that won''t support the work of the unit -- which is focused on beginning reading (levels A/B, C/D). But before you put those books away, you might instead keep these books available so long as you have a way to manage workshop with different types of reading in mind. A simple management strategy is to designate part of reading workshop as "book bin" time where kids read their independent, just right books, from their book bins (or baggies). Then switch to "baskets" where children read from separate baskets of emergent storybooks, shared reading texts, and look books. This makes it possible to manage the amount of time kids spend reading just right books versus other types of (also important) texts. By the time you reach this unit, you may want to infuse your library with some fresh leveled books, that perhaps you've been saving, set aside somewhere. If books are in short supply, you might rearrange the books that have been on the shelves to create new interest. It's likely that you'll need to make a range of levels available (A-H is typical), adding new books as children grow as readers. 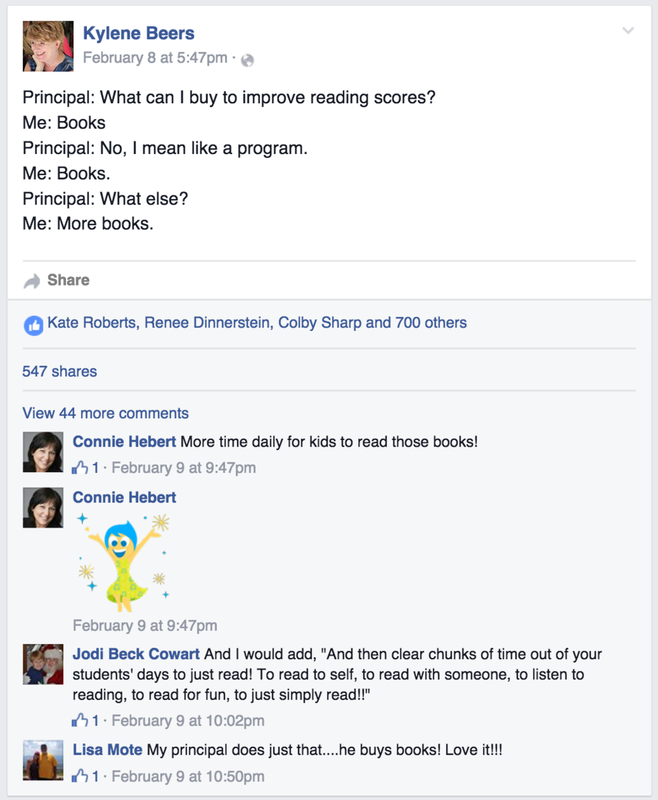 I think this post resonated for so many of Kylene's readers because of the truth of it: books make all the difference, yet schools often continue to search for some other magic bullet. Often we (all of us: parents, teachers, and administrator alike) go looking for programs even when independent reading time is continually shortchanged in our buildings and good books are in short supply. Donalyn Miller recently wrote an excellent post summarizing the research on the effectiveness of independent reading. This is research that every teacher needs to know about. It resonates with what in our heart of hearts we already know to be true: kids need lots of time to read books in school, and they need access to lots and lots of good books to read. A first step toward making your classroom into a place that inspires kids to want to read a lot of books is to do a quick self-reflection on how things are going for you in your classroom. 1. Is the classroom library inviting and attractive? Does it inspire kids to want to read? 2. Is the classroom library organized by topics, interests, authors, characters, genres, and other categories that will spark curiosity? 3. Can kids find books that they can read with ease and fluency, whether they are marked with a level of some kind or not? If the levels are marked somehow, are you confident that the levels are somewhat accurate (to the extent that is possible since no leveling system is perfect)? 4. Are there enough books? (See below for a tool to help you with this). 5. Have you considered putting aside some of your books for later in the year? (For example, books that are clearly too difficult, or books that will be wonderful for a later unit of study). 1. Are there enough books in each book baggy to easily last a child one week? (10-12 for beginning readers, levels A-F, 8-10 for transitional readers, levels G-I, and 6-8 for early chapterbook readers, levels J-L). Do they swap their books routinely (about once a week) for fresh, new, exciting books? 2. Are the most of the books in the baggies matched to the reader for independent reading (with deep comprehension, ease, and fluency), plus some books that are instructional or practice texts? 4. Are there any tools for reading workshop in the baggy? (For example, pointers, bookmarks, mini-charts, personal word wall, alphabet or blends chart, conference or small group reminders). Now that you've done a little reflecting, you may need to look a little closer. It might be helpful to do an inventory, to see what kind of books you really have and how many. Recently I did a quick informal inventory of every classroom library in our district (phew!). Through some trial and error, I created a template that you might find helpful as well. Once you know how many books you have, plus have an idea of what you need, you can create a wish list of ordering and donation requests. Kathleen Sokolowski's third-grade classroom at Saltzman East Memorial Elementary School in Farmingdale, New York, is the epitome of organization. She uses the space so well. Even the tiny area between the windows is used to display more book covers that might hook kids! The book covers and photos of authors on book baskets draw kids in. It's so easy to take these small details for granted, but these are things that kids are attracted to, and will remember long after they've left your classroom behind. Wouldn't you love to be a kid in these classrooms? Need some more inspiration? Chances are you need not look any further than your own school building! The next chance you get, pop into some of your colleagues' classrooms and gather some inspiration of your own. Bring your camera and take some notes on the pros and cons of different classroom library systems. Your kids will thank you for it! Next week, my family and I will go on a road-trip to New York City to celebrate the birthday of a close friend. Traveling with young children is not a simple task! We’ve planned the whole trip around nap times, meals, and bedtimes, knowing that if the kids don’t sleep, well… none of us will have a good time! Planning your reading and workshop is similar in so many ways. You’ll want to schedule things in advance and in a way that makes sense. And of course, much like a road trip to the visit friends, the plans have to be flexible -- you’ll need to be prepared to ditch those plans if something comes up. It is with this in mind, that you might set about creating a roadmap for your year – if you haven’t already. In our family, when we plan a trip, we have to come to agreement on the things we'd like to do. In New York next weekend, we've all agreed our first order of business is to see our friends. After that, we each have our own wishes. Brinton wants to take a trip out to L&B Spumoni Gardens to have our favorite pizza ever. I want to take our daughter, Lily, to a Broadway show. Lily wants to go to the Bronx Zoo and Coney Island. We can probably do all these things – as long as we coordinate plans and compromise a little. Ideally, when you plan your yearlong curriculum, you’ll work together with your colleagues to coordinate plans. Rather than getting together, talking, and then heading back to your own classroom to revert back to each of your old ways, you should make a game-plan that spans all the classrooms on your grade level. Even better, make a plan that spans across grades. Use a shared electronic document, like Google Docs, and come to an agreement on what units make sense to teach, and when. The plans don’t need to be set in stone – they’ll become a living document, one that you can revise and change from year to year. All this will help you decide which units of study to teach, which ones to add in, skip, or move around. If you’re reading this post, chances are you are familiar with the series Units of Study for Teaching Reading, as well as the sister series Units of Study for Teaching Writing by Lucy Calkins and Colleagues (full disclosure: I am a coauthor on both of these series). The four spiral bound units in those series can form a backbone for your yearlong curriculum – but they are not enough for an entire school year. If you’re using the Units of Study, you should plan on teaching about 6-8 units of study per year. The If…Then…. Assessment-Based Teaching books provide 5-6 extra units per grade level that you can choose from to fill out your school year. You might also look to books by Carl Anderson, Kathy Collins, Smokey Daniels, Mary Ehrenworth, Ralph Fletcher, Irene Fountas, Anne Goudvis, Steph Harvey, Georgia Heard, Chris Lehman, Ellin Keene & Susan Zimmerman, Debbie Miller, Stephanie Parsons, Gay Su Pinnell, Katie Wood Ray, Jen Serravallo, Tony Stead, and others for units of study. You and your colleagues might also have some units of study you’ve written yourselves! What can your kids already do as readers and writers? What do you want them to be able to do by the end of the year? How comfortable are YOU with teaching the units of study? How much experience do you have with the units? This plan allows you to rely on the highly supportive spiral bound books in the Units of Study, before moving to the If…Then… Assessment-Based Curriculum, where the units are summarized in a way that leaves more of the planning to the teacher. Beyond the first year or two, however, it will make more sense to design a yearlong curriculum that matches the needs of your students more closely. For example, the next example does not simply follow the order of the books. This reflects plans for kindergarten students that have very little literacy experience outside school and will benefit from extra emergent reading and writing unit tucked into the start of the year before moving into foundational skills units and print work. In another example, this team of teachers knew that the majority of their incoming students ended the previous year below the grade level reading and writing benchmarks. Aniticipating that many of their students would experience summer slide, they decided to adapt their curriculum to include emergent reading, and to add an extra reading time to their daily schedule to provide intervention and more time with books for all students. Another way to go about your planning is to plan backwards by thinking about your end-of-year goals first, then work your way up to them. In the following example, teachers knew from previous years that teaching nonfiction as the final unit of study had not worked for them. Their students' reading volume tended to dip during nonfiction units, and the last 6-8 weeks of school had been a challenging time to keep kids engaged in reading and writing. Therefore they decided to end the year with reading fairytales, and writing independent cross-genre projects. They knew their kids would absolutely love these units and would likely read and write with high volume and stamina right to the last day of school. Once they decided on that, they planned the rest of the year to lead up to it. Living in rural Vermont, I work in many schools where multiage classrooms are the norm. The wonderful thing about the Units of Study series is that although the minilessons in every book may be geared to grade-level standards, they are actually multi-level in many ways, and are often quite transferable to other grades. Even though the box may say “Grade 2” on it, in most cases it is actually quite easy to transfer many of the strategies up or down a level or two! If you teach multiage, you basically have the advantage of having twice as many units to pick from. Personally, I wish every teacher could have access to the grade above and the grade below sets of books, multiage or not! Another factor you might consider is how to integrate social studies or science in ways that still allow plenty of room for teaching reading and writing. Traditionally, schools have tended to put content up front in the upper grades, and reading and writing skills and strategies wind up being taught incidentally– it’s been a long and winding road to get to the point where reading and writing have their own space in the curriculum as subjects to be taught unto themselves. However, as students move through the grades, and gain years of experiences as skilled readers and writers, it is possible to maintain a reading and writing workshop that truly teaches the skills of strong reading and writing AND integrates content. It’s a fantastic idea to share your end-of-unit celebration dates for reading and writing on a shared calendar or a digital document so that you can easily see who else you might combine celebrations with you. Kids thrive off of positive feedback and social experiences, so to make the most of your end-of-unit dates, invite other classes to join you. All the skills and strategies will be reinforced multiple times across each and every school year in a variety of contexts. In other words, you should be developing a spiraling curriculum. Students are given opportunities time and time again to return to similar work with a new lens, and while reading books at new levels of text complexity, and writing new pieces. If your students haven’t yet mastered something in Unit 1, rest assured, you’ll be revisiting it at multiple points across the year – and across years. Additionally, committing to an end date for each of your units help you plan your pacing strategically, keeping the big picture of your entire year in mind. The start of each new unit breathes necessary life and energy into your classroom, and contributes to an overarching goal for the year: fostering a love of reading and writing. If a unit stretches on forever (trust me, more than six weeks will feel like forever), not only does that mean less time for studying other genres, text types, skills and strategies, but it also means your students’ engagement will falter. It’s like the difference between a nice, fun, 4-5 hour road trip, or a road trip where the car breaks down and it winds up taking 3 days. Ugh. No one wants that. Speaking of road trips, I'd better start packing for my own adventures! Visit a classroom with a strong reading workshop, and chances are you will find students' books filled with Post-its. Kids stop and jot notes to themselves often as they read, as way to make their reading work visible, to stretch their ideas, as reminders, and as tools for preparing for conversations. But sometimes, things can go astray. Sometimes, kids aren't using notes to mark their thinking--they're doing it to please the teacher. Sometimes, kids aren't sure what else to be doing, so they jot note after note, without any sense of purpose for all those notes. Sometimes, kids are spending more time writing during reading time then actual reading. Yikes. If you've ever looked around your classroom during reading workshop and seen the floor littered with lost Post-its, and discovered kids' books filled with so many Post-its they look like feathers, you are not alone. But these are not reasons to give up on using Post-its (or a reading notebook) as a tool for making thinking visible. In fact, if your kids are struggling with jotting notes that are purposeful, that's all the more reason to work on it. Too many Post-its (or pages of note-taking during independent reading that is supposed to be "just-right") is a sign that kids aren't sure how to determine importance. When a student is Post-it'ing anything and everything, you might confer with her. You might teach her that readers don't usually just jot notes because they have to -- we usually have a clear purpose for jotting notes -- to prepare for a conversation with a reading partner, or to keep track of confusing parts, or interesting ideas in the book. You could make a terrific chart titled Reasons to Use a Post-it, and then create it together with your students (including picture clues), based on the work they encounter in their books . You might also need to physically demonstrate taking Post-its out of your own book, thinking aloud as you go about the reasons why you don't need this one--but yes, you do want that one. Zero Post-its, or zero reading notebook notes might be a sign of either a) a disengaged reader, b) a mismatch between the complexity level of the book and the work the reader is working on, or c) a reader who doesn't have plans or goals for his reading. Every kid is different of course, but a child who hasn't felt the need to record even one idea, or interesting quote, or even a question or idea to talk about with a reading partner... this might be a sign of something bigger. The question to figure out is WHY. You might do some research to see if the student is choosing books that are a good match for him (or even, does the student have any choice in books at all?). You might research further using a running record, or an in-book assessment, to find out what comprehension work the student excels in, and what work would make sense as an area to improve in. Then match the note-taking strategy to the needs of the student (if note-taking even makes sense). "Do I have to? It gets in the way! Argh!" If you have ever had a student say this to you, you are not alone! Some kids (often the most avid readers in your classroom) do not want to slow down their reading to stop and jot. Understandably so! The point is not to force all kids to jot Post-its. The point is to provide kids with many choices of strategies that will lift the level of their thinking. Some kids (many) will benefit from stopping and thinking regularly as they read, and Post-its are a concrete reminder/tool/visual aid for doing that. Other kids might benefit from reading longer stretches of text, stopping at the end of each chapter instead of each page, or stopping a handful of times in a book to use jotting as a tool for monitoring their own thinking and pushing themselves to think more deeply. I'm always wary of any reading strategy that takes me more than a few minutes to wrap my head around, or requires a significant amount of teacher preparation just to make it go smoothly. Sometimes, the strategies for using Post-its can become so multi-stepped, so elaborate, that I have to wonder: If a kid has to do all that just to understand and find meaning in her books (that she herself has chosen), I have to wonder if those books are at her independent reading level. Maybe, sometimes, the best thing to do is to just pick a better-fitting book! Summer time is what I like to think of as "Institute Season." This is the time year that I either teach or attend course after course. By mid July, my mind is swimming with new ideas for my teaching, inspiration, and of course, a long list of books I'd like to own. With all the courses, twitter chats, institutes, and seminars going on, it's sometimes easy to lose sight of what teaching reading and teaching writing are really all about. Lucy Calkins once told a group of us, "If you try to do everything, then you wind up doing nothing." And it's true. It is overwhelming to add anythign and everything to next year's plans, without a clear sense of priorities. One powerful tool I have learned to depend on is what my colleagues at TCRWP like to call "Bottom Lines." Ask yourself, "What are my bottom lines for teaching reading?" Right now, on a piece of paper, jot down your top five (or ten) things that you believe must, absolutely MUST, happen in a reading workshop. Now do the same for writing. Chances are you did not write about the color of the borders on your bulletin boards, or the brand of carpet in your meeting area. When you boil it down, there are a few things that really matter a lot in teaching reading and writing. My bottom lines are a combination gathered from my experience as a staff developer, from professional books and conferences, and from research on effective teaching (Danielson, Marzano, Hattie, and Cambourne especially). These bottom lines are a living document, changing and growing along with my practice. 1. Readers and writers need to read and write a lot. Volume and stamina matter, and any model of instruction absolutely must provide time and space for practice, practice, practice. Reading and writing workshop need to happen every day if we expect to see results. 2. Instruction is most effective when it is relevant and meaningful to kids. Planning and teaching units of study, launching and celebrating units, and planning for authentic audiences and purposes are all ways to make instruction relevant and meaningful. 3. Clearly articulated expectations and goals are a good thing. Displaying exemplars, using kid-facing rubrics and checklists, displaying anchor charts and examples of all kinds of student work, demonstrating how to make mistakes and try again--these are all ways of making expectations clear, and supporting kids to set and work toward goals. 4. Teachers are researchers, adapting instruction according to what we learn about the kids. To teach effectively we use multiple forms of assessment to gather information and get to know students so that we can differentiate our instruction. 5. Reading aloud to kids is crucial. It is one of the few things that every researcher, every teacher, pediatrician, and every parent pretty much agree on. If I could only choose one thing to do each day with kids, it would be read aloud and talk about books. 6. The classroom environment is my coteacher. If kids can see it, then they are learning from it. Everything from the way the tables or desks are arranged, to the charts and student work on the walls, to the lighting, the way the books are arranged in the classroom library, how I make materials available (or not), the tone of my voice, and the words that I use with kids implicitly or explicitly teaches kids something (whether I intend it to or not). Classroom environments are worth spending time on and planning for. 7. Teaching reading and writing effectively requires a reflective stance. Every minute I am thinking, "How did that go? What could I do differently next time?" Teaching is all about starting over and trying again. Each day there are multiple opportunities to outgrow our thinking and do better. Each day a new beginning, each unit of study a fresh start, each year a new group of students. This summer I'll be teaching a session at the Vermont Reads Institute focusing on small group work inside reading workshop--and I couldn't be more excited for it. What does guided reading look like in your classroom? Chances are, guided reading looks different in each person's classroom. Teacher selects a book that is within the child's zone of proximal development. It is a book that the child could read on her own with 90-95% accuracy, some fluency, and comprehension. It is not a hard, frustrating book, nor is it too easy. There is a bit of work the student will need help with--but just a bit. The book should also be interesting and engaging. Then, the lesson essentially follows the following structure. The list could go on. Chances are I've either confirmed a few things you already are practicing (hooray! ), or perhaps you have a few questions. How does this compare with what guided reading looks like in your classroom? Please leave a comment, share your thoughts, and ask questions.